As the shift of fuel from 1.0% to only 0.10% sulfur content will cause significant extra costs for Containerships, we are obliged to implement a MARPOL Surcharge. As we foresee that the switch to the cleaner fuel will start as early December, in order to ensure full compliance by 1st January 2015, we hereby inform you that we will implement a surcharge effective from vessels loading after the 15/12/2014. The surcharge will appear as a separate billing item on invoices. We will undertake regular reviews of our MARPOL Surcharge and customers will be advised following any updates and changes. Please find below our MARPOL Surcharges. MARPOL – New Legislation will limit fuel sulphur emissions from all ships operating in three major areas of northern Europe. How will this affect you? Effective from 1 January 2015, the MARPOL (The International Maritime Organisation’s Marine Pollution Convention) will set a further reduction on marine fuel sulphur cap of 0.1% in the Northern European Sulphur Emissions Control Areas (SECAs) comprising the English Channel, the Baltic and North Seas. In these so-called Sulphur Emission Control Areas (SECA’s), ships must use fuel with a maximum of just 0.1% sulphur content – down from the current 1% limit – or adopt alternative solutions that achieve an equivalent effect. The cost implications will have an effect on shipping companies, their freight customers and road transport operations. What is Sulphur dioxide and why is there a need for ships to burn low sulphur fuel? Sulphur dioxide or SO2 is produced when we burn fossil fuels and is a major pollutant (secondary greenhouse gas as it produces particles which could block sunlight.) It is toxic to plants and is the main cause of acid rain. It can also affect human health. Shore-based industries including the trucking and car industry have succeeded in reducing their SO2 emissions and ships have now become the major source of this pollutant with the European Union. In order to reduce this IMO and EU have introduced legislation forcing shipping companies to reduce their SO2 emissions. What are the consequences for shipping companies? The fuel with 0.1% sulphur content is marine gas oil or MGO which is more expensive than the heavy fuel (HFO) that ships normally burn which has 1 % sulphur content. As a result, fuel prices will increase. It has been estimated that ships trading within the area involved consume around 13,000,000 tons of HFO per year. Switching this to 0.1% MGO or liquefied natural gas (LNG) would mean an extra cost of approximately EUR 3 billion per year and it is entirely up to the shipping industry to cover this extra cost. Other compliance methods include using “scrubbers” to dilute the sulphur emissions to meet the 0.1% limit, however, these technologies are only available to new, modern vessels and there is no out of the box solution for all. Whatever the solution adopted by vessel operators, the commercial result will be the same. They will face an increase in operating costs. What are the consequences for Containerships customers? At this present moment, the full impact and cost implications for freight customers have still to be quantified. Based on current data, we estimate a cost of £40/EUR50 per teu in order to comply with this new legislation; the actual cost will be monitored closely on a monthly basis and the MARPOL Fuel Surcharge modified accordingly. We will communicate as early as Q4 2014 with a clearer Low Sulphur Surcharge depending on trade according to a consumer pay principle. 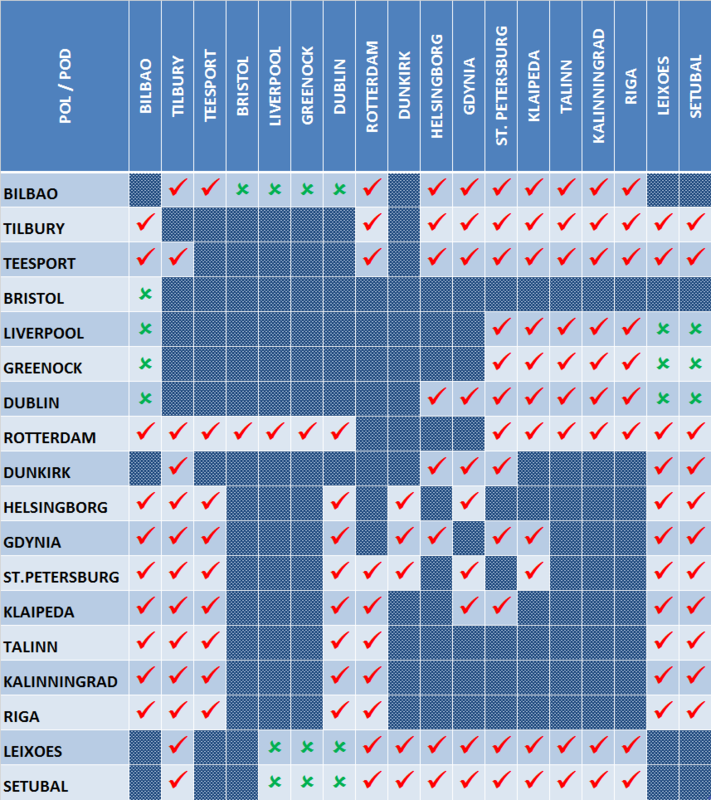 To see if your current Containerships service will be affected please see below POL POD Matrix Chart. Containerships will keep all customers informed and also work closely to continue providing the optimum solutions for your service requirements.